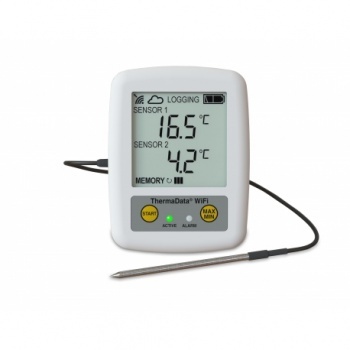 ThermaData TD1F - two channel thermistor WiFi logger with one external remote fixed probe and internal sensor. Internal sensor temperature range 0 to 50 °C, external, remote sensor range -40 to 125 °C, with a resolution of 0.1 °C/°F and accuracy of ±0.5 °C. This temperature monitoring system that wirelessly records the temperature. 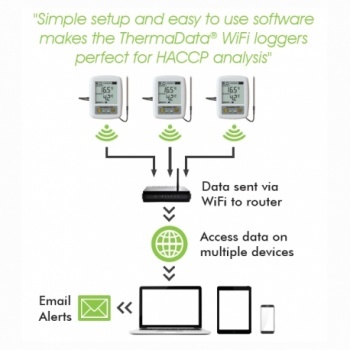 Each logger sends the data to a WiFi router connected to the net which can be accessed and viewed from a PC, laptop or tablet anywhere in the world. The loggers have a range limited to the specification of the users WiFi router. Each logger has a intuitive LCD displaying temperature, WiFi connection status, max/min recorded temperatures, alarm status and battery life. At programmable intervals, the loggers will record temperature from both sensors, recording up to a maximum of 18000 readings (9000 from each sensor). Each logger has a red and green LED. The flashing green LED indicates that the logger is active/logging and the flashing red LED indicates that your preset alarms have been exceeded. Each logger has a USB lead. ThermaData Studio software is available to download FREE www.thermometers.co.uk is licence free, with no subscription charges. Each logger communicates directly to the WiFi router at set intervals to push data through the internet intoThermaData Studio.